Maternelle avec Mme Andrea: Cahier interactif en maternelle? OUI, tu peux! 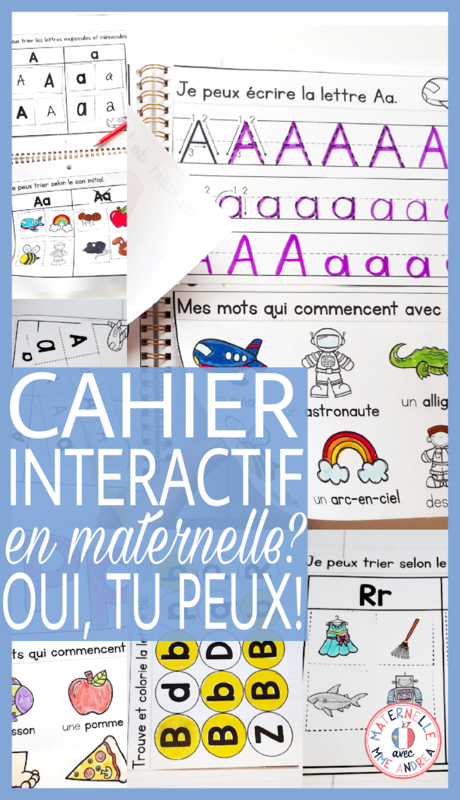 If you are a maternelle teacher just like me, you may have seen pictures and blog posts and products floating around called "Interactive Notebooks." 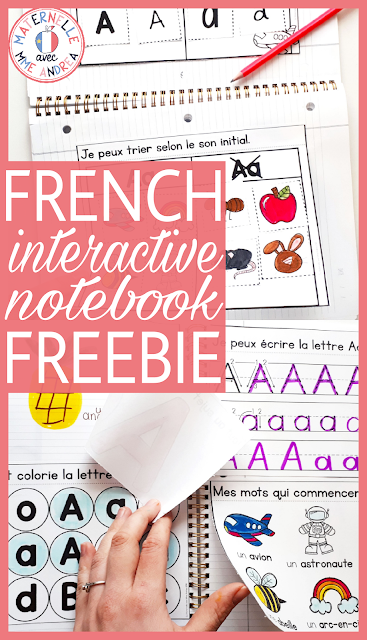 Interactive notebooks (cahier interactifs) are a super cool tool that your students can use to keep track of what they are learning in an engaging and interesting way. 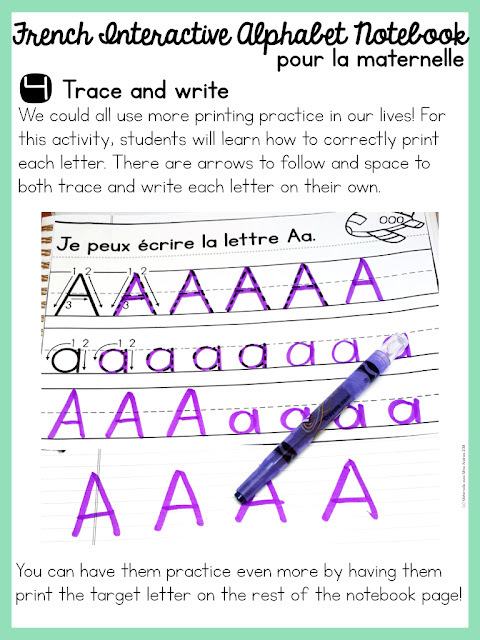 Students use a notebook or scribbler to keep track of what they learn and any activities they complete pertaining to the topic being taught. They cut out lots of interactive pieces and glue them into the notebook or scribbler. They require a LOT of cutting and a LOT of gluing!! They are often complicated and the amount of prep (read: cutting!) that students have to do is sometimes even longer than the learning activity itself, when it comes to our youngest learners. So, while I have borrowed some ideas from the interactive notebook movement over the years (like having a scribbler for my students to use to glue certain activities into instead of using tricky duo-tangs for everything), I have mostly just been sighing with envy when I have seen intricate and beautiful interactive notebook products uploaded to TPT. BUT, this year, I have finally sat down and figured out a way to make interactive notebooks happen in my classroom! As I stated above, the biggest issue for me was the whole cutting thing. Yes, it is important to practice fine motor skills and cutting in kindergarten, and yes, some students will be able to cut beautifully and produce organized notebooks that don't take hours for each activity and don't have all their pages stuck together with massive amounts of glue. But, cutting intricate shapes (or even straight lines) neatly is not something that every five year old can do with success, and I have asked myself many times, "do I want my students working so hard on the cutting portion of the activity that they are tired and discouraged before the real work even begins?" So, what's my solution? 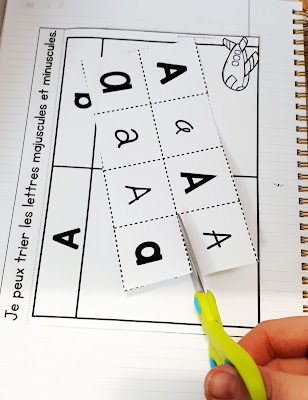 An interactive notebook product that has STRAIGHT CUTS ONLY - cuts that the teacher can easily do with one swipe of the paper cutter! 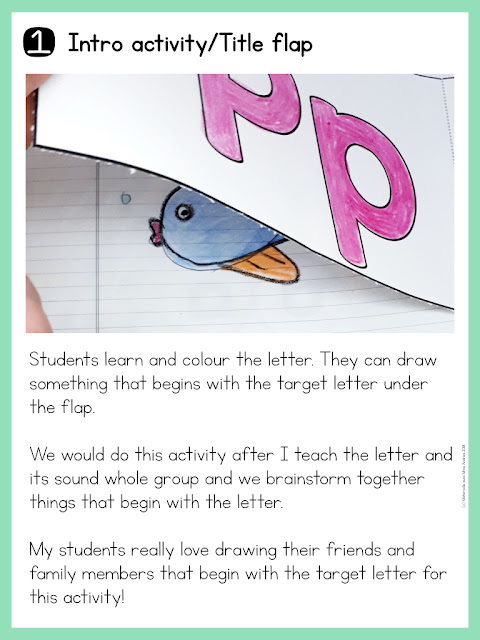 To help us master our letter names and sounds, I created an alphabet interactive notebook to try with my students this year. The activities are printed two to a page, and I just slice down the middle of the page for each activity! One cut! This means that for most of the activities, there is NO CUTTING for students! There is also only ONE strip for glue for each activity. One swipe of a glue stick creates a "lift the flap" option. And, it is an option - if you prefer students glue each activity down flat, that is totally up to you! 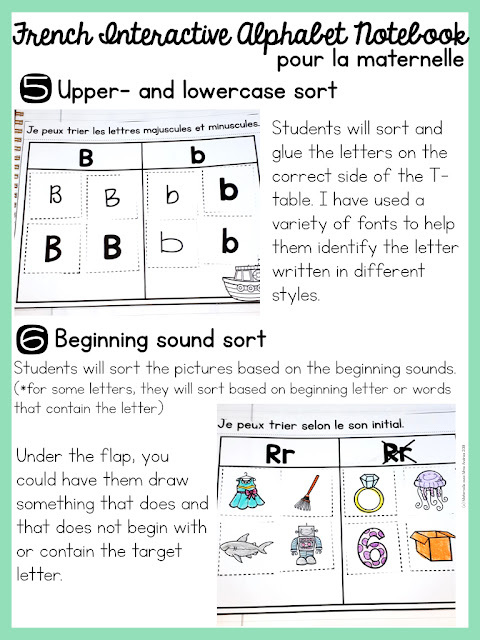 And, because we do want our students to have some cutting practice throughout their day, there are two sorting activities for each letter. For those, I cut the solid lines and my students then cut along the dotted lines. They are straight cuts as well, and my students have had great success with them. 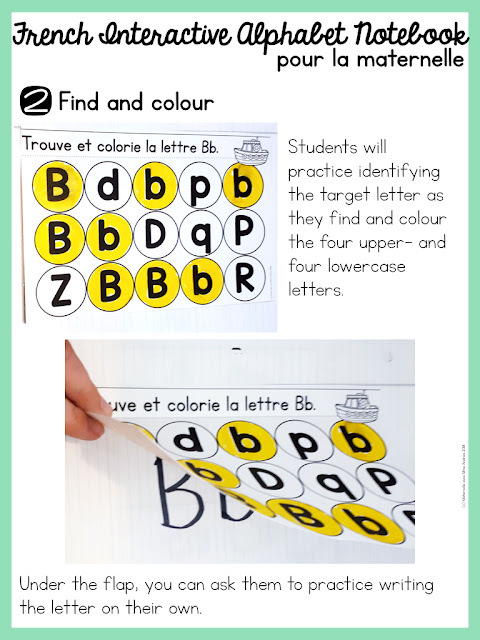 If you are wondering what kinds of activities are included for each letter, you can try out the letter Aa for free by clicking right here! 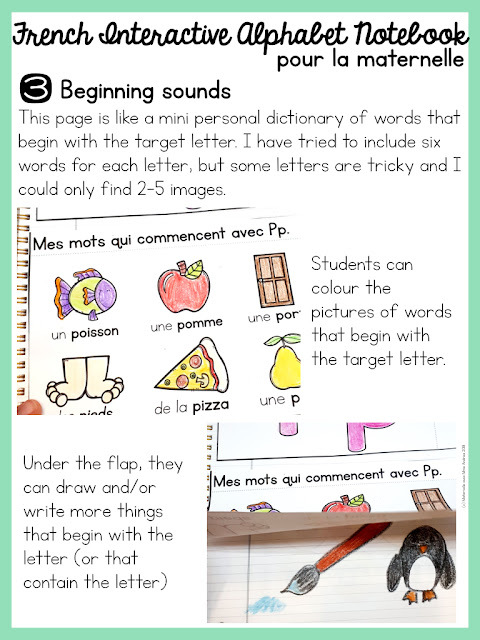 I love doing the beginning sound sort last, so that they can flip back and refer to the other activities in their notebook they have done for that letter to help them if they get stuck! Another great thing about these notebooks is that you can decide which activities you want to do, and how often. Maybe you work really hard on one letter per day, boot camp style (that's what I do), or, maybe you prefer to do one letter a week - you may want to do one activity per day, in that case. 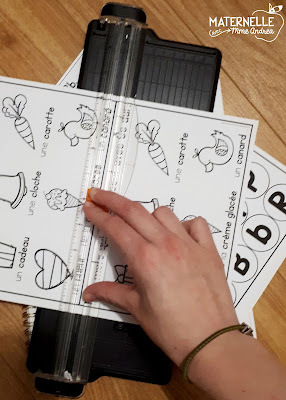 If you want to give interactive alphabet notebooks a try in your maternelle classroom, click here to see the product in my TPT store. 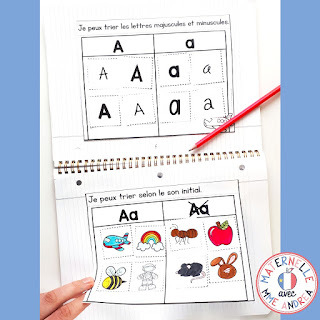 Don't forget that you can also try the letter Aa for FREE before purchasing, to make sure that these notebooks are realistic for your classroom. Every classroom is different, after all! If you are a member of my Free French Resource Library, you will also find the letter Aa sample in there, in the "Conscience Phonologique" section. ...and click the button. As soon as you sign up, I'll add you to the list and an email will be on its way with instructions for accessing the library. Easy! If you give my notebooks a try, I would love to hear about it below. I may try my hand at making some for other subjects or topics, so please write me a comment if there is anything you love and would want to see again, or if there is anything that didn't work as well as you had hoped!